Two notable things have happened since my last blog post (Fabriano, R K Burt and St Cuthberts Mill - and fine art watercolour paper for precision painting) about innovation and change within the world of Fine Art Hot Press paper used by watercolour painters who paint plants and flowers to botanical standards. . 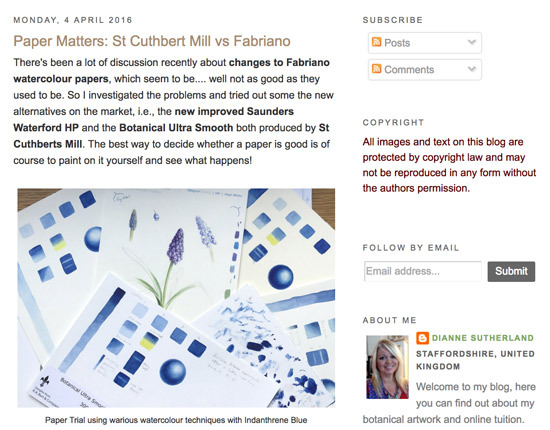 The first is that yesterday Dianne Sutherland published an extremely helpful blog post - Paper Matters: St Cuthbert Mill vs Fabriano. I should also emphasise that we're also beginning to see other artists try the new papers and commenting on the results via the Botanical Artists group on Facebook. makes a very generous offer of wanting to know more about what artists have experienced and offering to come and watch artists work on the paper and explain what sort of problems they have experienced. So this is all really GOOD NEWS! I've attached an image of the letter so you can all read it. I close cropped the letter to make it easier to reproduce. You'll need to right click and open in a new tab if you want to be able to read the larger version more easily. I'm now convinced they want to know so we need to show them! Now I just need to work out - with Dianne and other botanical artists who are interested parties - how we can demonstrate what has been happening to the Fabriano people so they can see for themselves. One option might be to set up a Special Group on Facebook to which people could contribute a narrative and/or videos and/or photos of their experiences and problems with the paper of late. That might lend itself to a virtual meeting with Fabriano if the logistics of getting everybody in the same place were to prove too difficult. or contact me via my email address (see contact me in side column). I started a painting in December on 300lb hot press Fabriano and had to abandon it in frustration with the fluffy absorbancy that made getting a nice edge impossible. I have that sheet and the one I ultimately finished with no problem on 140 lb. HP. 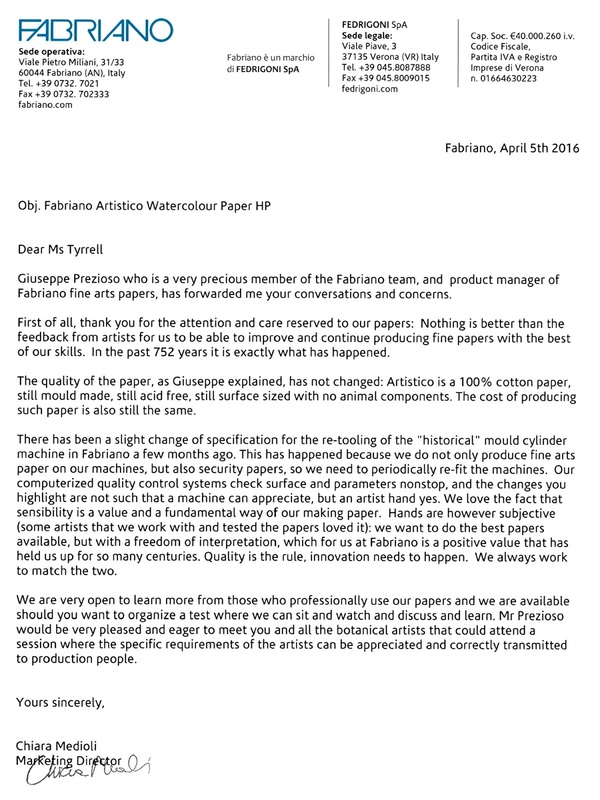 I live in the US so meeting with Fabriano is not possible, but I would be happy to contribute my experience with the problem paper to the situation. I made an earlier comment. I am not using my Fabriano hot press paper for botanical art in this case, but I am using this paper to make transfer monoprints, and the new surface of Artistico is very nubbly and "reads" as a mistake in the prints that I am making. So, I don't like the new surface, and I am presently looking for alternatives. I see a holiday opportunity (if only)! Well done on getting them to write back Katherine. Excellent news as it opens the dialogue. I'm glad the company are able to admit that computers aren't always capable. I have only used one sheet of 300lb, found the same fluffing up problem that everyone has mentioned. But also a point to mention might be that drops of clean water that inadvertently landed on the paper left a surface mark after being blotted off. This wouldn't have happened before. I am a professional watercolor artist and illustrator who has been using Fabriano Hot Press 300 paper for almost 15 years. This spring (2016) I noticed in all of the new sheets that the paper seemed to absorb the color immediately. I didn't have any time what so ever to do any blending in the wet area's. In an area where the color needs to be large and solid the new paper has a blotchy appearance. When putting clear water on the paper it leaves " soak in " marks. It is so difficult to work with. At this point I have ordered multiple sheets from different vendors and thrown most of them out. If others have a suggestion of a 300# hot press paper similar to the old Fabriano that I new and loved I would be thrilled to try it. I live in the US.